My husband and I celebrated our 39th anniversary on November 15th, and as a special gift, he presented me with this AWESOME book! 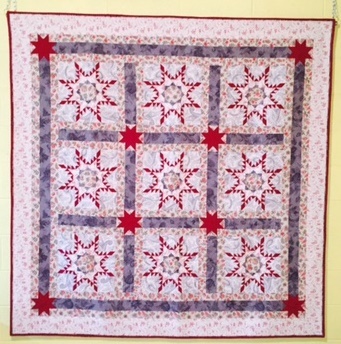 I have seen a photo of the quilt that graces the cover many times over the past year, and that beautiful honeysuckle flower always catches my eye. There is something about the shape of the petals that I find charming. Do you have a particular shape that catches your eye? Over the past year or so, I have been making basket blocks here and there. The plan is to put them together in columns with an appliqued panel in between each column. The panels will feature the honeysuckles draped on a vine, with a border around the outside also featuring applique. What pattern am I following? I don’t have a pattern. Other than the shape of the petals, the design will be free-form in nature, much the way quilters long ago created their quilts. These are the baskets that I have thus far. I have many more to make! They will finish at 10 inches square, however each basket will have a neutral background that they sit on, so each basket get four triangles (one per corner) to square them up. Hope that makes sense. The quilt will be scrappy in nature. I plan to show the progress of this quilt as I go along so you can see how I work. This is a “do-as-I-go” project, so anything can happen! The Honeysuckle flowers will be so nice with the pointy basket pieces. It will be fun to watch the progress.